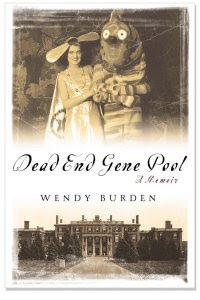 Dead End Gene Pool was a humorous tale about a childhood that was anything but. Author Wendy Burden, a descendant of Cornelius Vanderbilt, poignantly tells the story of her upbringing in a manner that will take you on a roller coaster of emotions. She is a girl trapped in a complicated, lonely, and unemotional world following the suicide of her father, which sets her up to inherit her own tidy fortune at the age of 21. But until then, she is forced to suffer the folly of eccentricity and self-absorption. But she does so with a sharp wit and a mature sense of self.The extravagance of her grandparents lifestyle — the servants, the parties, the shopping — is shocking. Her mother’s neglect — largely because she is too busy focusing on her tanning, her drinking, and finding a man — is disheartening. Burden briefly recounts some inappropriate behavior at the hands of her grandfather’s boat captain, and her mother’s reaction to hearing of the incident. Exasperated, she admonishes Wendy to indulge the old man, who just wants to have some fun. After all, he was shot in the groin during the war, so he can’t pose much of a threat, she rationalizes. All the shiny packages in the world can’t make up for that kind of parenting. Young Wendy, with her devotion to all things Addams Family, her dramatic flair for everything, her fascination with the macabre, is an easy child to love, largely because she needs loved so badly. Wendy goes through a phase in which she imitates Wednesday, the morbid Addams child; she builds her own guillotine and beheads her Barbie dolls. When Wendy learns that it is a family servant who does the Christmas shopping — not Santa — she refers to it as the Betrayal. She is one in a long line of eccentric collectors; her grandparents collect wine and art, her mother, Wendy muses, collects tans from around the world, her uncle collects Nazi memorabilia. Wendy? She spends one summer collecting dead birds at her grandparents Maine cottage. Her next phase is self-medicating with antacids. Then she moves on to books. And writing obituaries. Don’t misunderstand; Wendy Burden is not portraying herself as a victim. Hers is a fascinating tale of a quirky, self-absorbed, damaged family and the little girl who survived it. Ironically, while she was surrounded by people who were lost in themselves — and their excesses — Wendy discovered who she was. What a fascinating, humorous, and enjoyable read.